Yesterday we had our follow up appointment with our ENT to review Nika's sleep study results. The sleep study was way back in February, mind you. So the results were basically inconclusive. We learned nothing ... all because of the really.smart.sleep.study.tech. Apparently the tech failed to make sure that the belt around Nika's belly remained intact ... and thus they did not get the readings they needed. As if the tech doesn't know that the belt needs to remain intact? As if he didn't know it wasn't picking up a reading the entire time we were there? This honestly just irks me. Now we have to repeat the sleep study, however I've asked if there is another facility that we can use. The facility we have been using is horrible, not to mention having to wait for several hours every.single.time we go there. seriously there is no reason for that mistake. I can't imagine the frustration! That's terrible. You'd think the tech would get it right for crying out loud. I can't figure out how anyone can sleep being hooked up to all that stuff. I hope they do not charge you for any of it...or if they have and you've already paid you should be reimbursed...that just irks me too! GRRRRRR... come on people!!! how FRUSTRATING (an understatement)!!! i would hope that you and insurance will not be billed for the second sleep study since it was obviously their fault that it was "inconclusive". why does everything have to be more complicated than it needs to be??? hope your weekend is better than your day yesterday finding this out! Are you kidding me?! Wow, that's just so annoying! 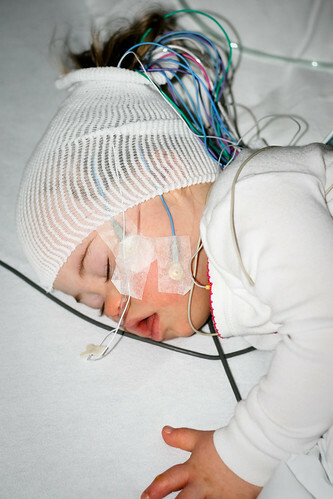 I know that during Kayla's sleep study the tech kept coming in adjusting stuff because Kayla kept knocking things off. oh how awful! i can't imagine the trouble they're putting you and your little girl through again. i think sleep techs should try the test on themselves to see how to have better bedside manner. my friend's child was given 15 minutes to fall asleep or else they'd have to reschedule. are you kidding me? well, they had to reschedule. ugh.